Posted on December 18, 2015 at 10:46 am. 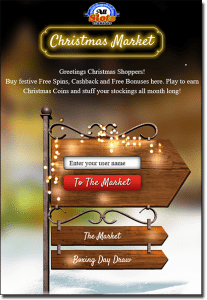 This Christmas season, All Slots Casino is giving players the chance to transform their loyalty points into an assortment of festive goodies including free spins, cash back offers and free casino credits within the charming pop-up Christmas Market. For the month of December, all existing and newly earned loyalty points will earn you one Christmas Coin per point, which you can then use in the Christmas Market to spend however you see fit. You can play to earn even more points to transfer into coins, and keep an eye out in your All Slots account as there’s also free coins on giveaway all month long to pump up your coin collection. To see what’s available for you in the market, head to the Christmas Market promo within All Slots promotions tab and enter your user name. If you’re not familiar with All Slots loyalty program, this is the casinos way of rewarding you for playing at their site. Registered players receive one point for every $10 wagered, with points that can then be redeemed for all kinds of casino bonuses. Players also move their way up through loyalty tiers as they accumulate more points, being eligible for more rewards the higher the loyalty status. The Christmas Market promo is a fun way to get even more out of those loyalty points. Note that for each Christmas Market purchase you make, your loyalty points will diminish but rest assured that you will retain your loyalty status. Talk about bringing the new year in on a high note! 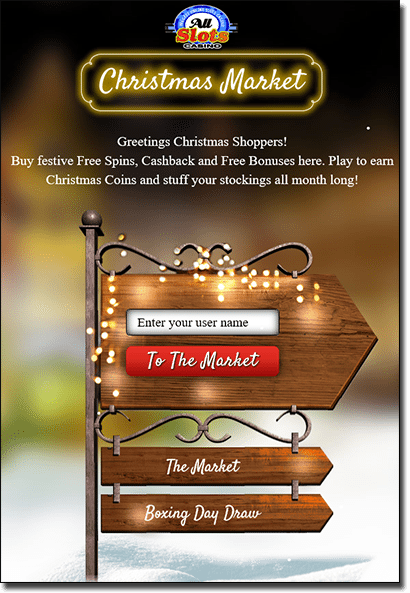 The market closes on Christmas Day, so hop to it and start playing at All Slots to collect those Christmas Coins. New to All Slots Casino? Click our links to register and you’ll be warmly welcomed with up to $1,600 in matched deposit bonuses when loading real money to your account for the first time.